Your workstation cart can become a rolling stand for your laptop with the adjustable notebook arm. 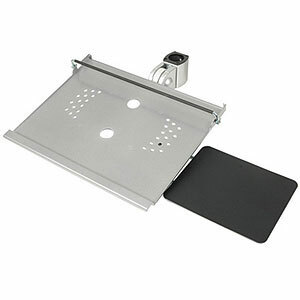 It can be added to either single-slot or quad-slot workstation carts and features a horizontal clamp to keep your laptop securely affixed to the tray. The tray is vented and constructed from heat-conducting aluminum. Laptop and workstation cart not included. Assembly required.